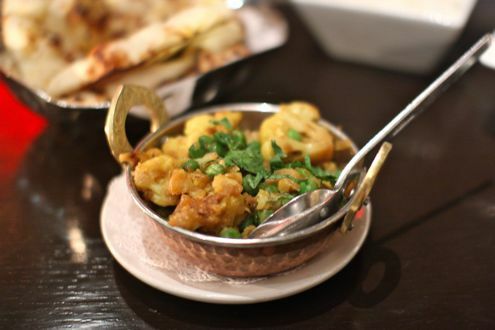 Rachel and I have always loved Rasika, and with her brother in town from Seattle, we wanted to show him that Washington D.C., just like the Emerald City, is a dining destination. 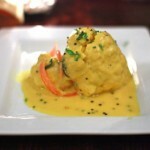 Rasika West End, just like its Penn Quarter counterpart, has been in high demand since it first opened its doors. In fact, we had to book our reservation nearly a month in advance to lock down a table for a Saturday night. After toying with the idea of ordering the four-course tasting menu, we ultimately decided to share a bunch of plates and go the a la carte route instead. That turned out to be a very wise decision since there was so much we wanted to try from Executive Chef Vikram Sunderam’s kitchen. 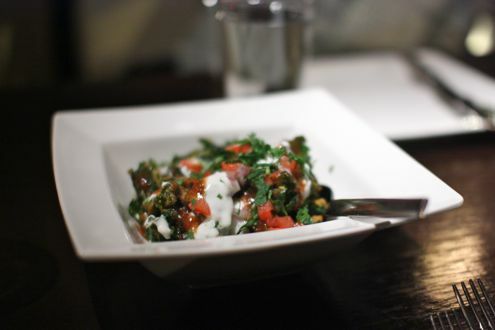 Of course, one cannot visit Rasika without ordering the trademark palak chaat. 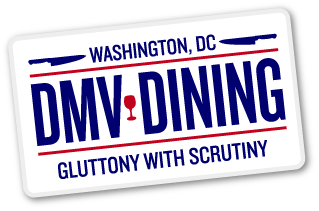 There is a reason why this is one of the top dishes in the District. Featuring crispy baby spinach, yogurt, tamarind, and dates, the combination of ingredients amounts to a memorable first course. Just as good were the honey ginger scallops. 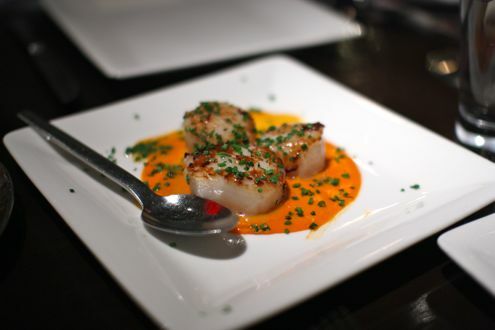 Typically two to a plate, our waiter was able to accommodate an additional scallop for our table for an additional fee. The scallops were large with with a nice blend of flavors from the honey and ginger with just the right amount of sear from the kitchen. 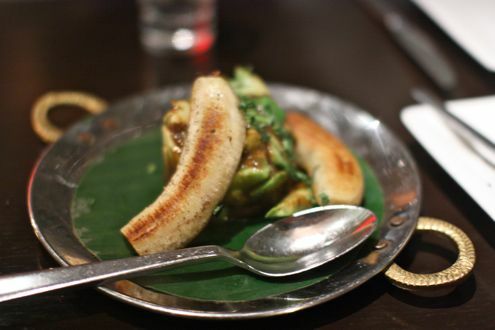 Not to be outdone was the banana avocado chaat. 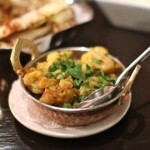 Just like the palak chaat, this was an exceptional dish. Prepared with cumin, red chili powder, tamarind, and date chutney, the combination of crispy banana and creamy avocado made this my favorite plate of the evening so far. You wouldn’t think these flavors would go well together, but they blended perfectly and we couldn’t get enough of the grilled banana. We decided to share two entrees amongst the three of us after a trio of fantastic first courses. 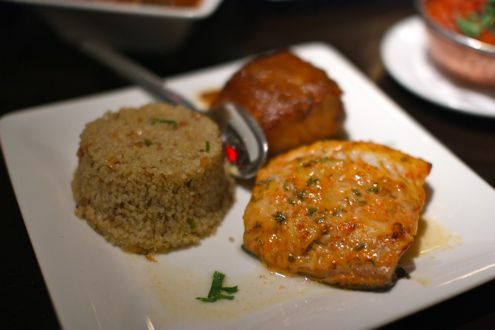 First was their signature Khatta Meetha black cod. Unlike the Penn Quarter location, it’s prepared two ways at West End. The first preparation uses their classic recipe of fresh dill, honey, star anise, and red wine vinegar. 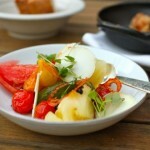 The second preparation, however, incorporates a cheddar and tamarind glaze. In short, both pieces of fish were absolutely stellar. 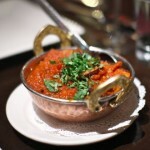 Next was another West End exclusive — Salli Boti. 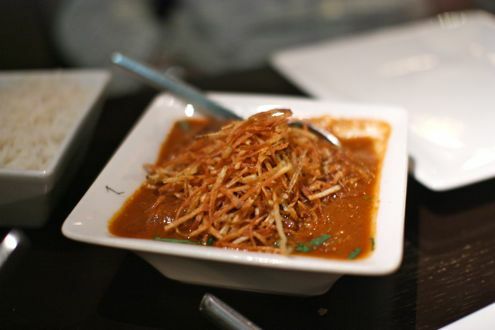 This savory Parsi dish features tender chunks of lamb, onions, tomatoes, apricot, and straw potatoes. 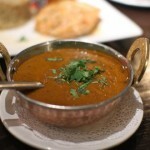 It was essentially an Indian stew and made for great comfort food. On top of all of this, we also ordered a trio of vegetarian sides to share which ranged from eggplant to smoked lentils to cauliflower. 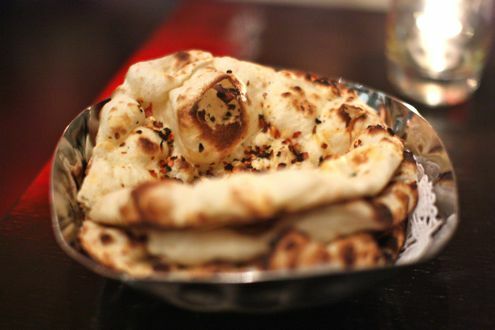 Oh, and you can’t have an Indian meal without an order of naan. Rachel and I opted for the garlic naan while David, Rachel’s brother, went with the spicier chili olive variety. 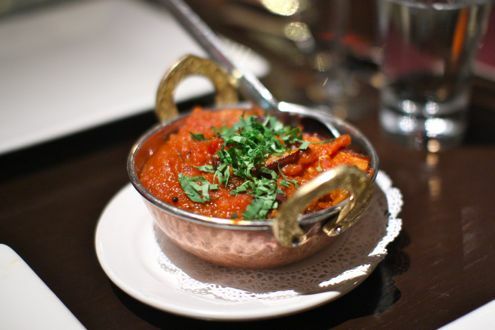 There’s a reason why both locations of Rasika are one of the toughest tables in town – they serve up the area’s best Indian food. 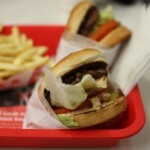 All three of us were incredibly happy with what we ordered, and there were no regrets once we finished. On top of that, our waiter was incredibly knowledgeable with the menu and actually recommended the Salli Boti to us after debating what to order with the magnificent black cod. 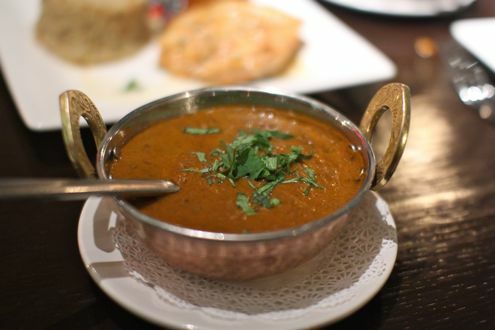 Between the exquisite food and wonderful service, it’s no question why Rasika is so cherished in the District.